Kitchen organizing - a hanging basket that has changed my life! 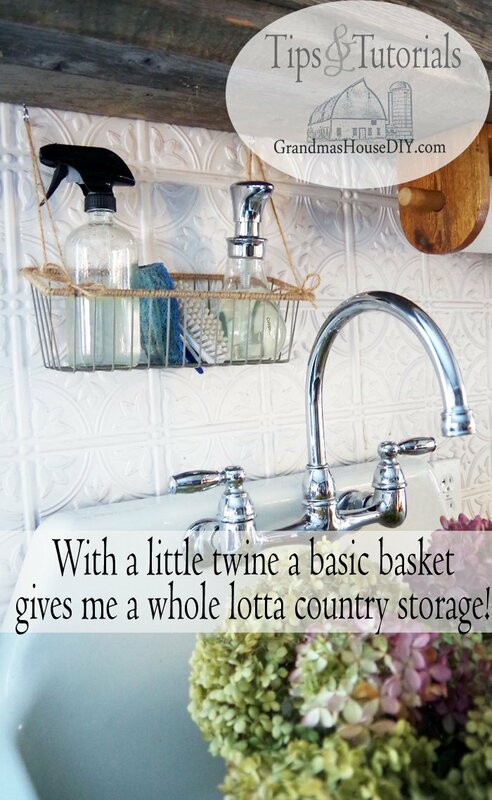 Kitchen organizing – a hanging basket that has changed my life! After building my kitchen sink base to fit my antique cast enamel sink I thought I had all of my storage needs well in hand. Well, it just goes to show that you really never know until you live in it for awhile! As for general storage the shelves and wicker baskets I put beneath the sink do a great job for us. In the bottom basket I keep my onions and garlic, in the top basket I keep all of my kitchen soaps, extra sponges etc. However, no matter how many times I tried it, there was just NO keeping my day to day foaming hand soap down there (check out my recipe here), it was just way too inconvenient! 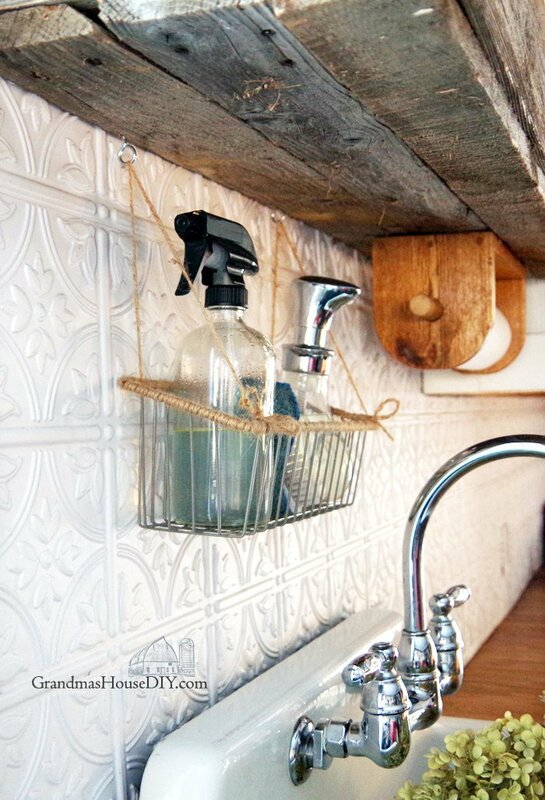 I also never wanted to drop my wet sponge or potato scrubber down there either because seriously wet + wicker + a wood shelf = just not a good combination. So, where did they end up? On that little ledge behind the faucet and, as you might imagine, they drove me crazy because I was constantly knocking them off into the sink. I’ve been living with this since we moved in but something happened the other day that finally drove me over the edge. I had a big roaster pan soaking in the sink so it was full of nasty, smelly, cold, dirty, day-old water that looked like it had an oil slick across the top of it. I knocked the foaming hand soap container down and SPOOSH: some of it went in my mouth AND down my shirt. So, that was it, I headed over to Amazon and did some looking for an inexpensive little basket that would accommodate everything we needed without being intrusive. I found this one and bought it immediately because I loved that the front of it was lower then the back. When it came though it felt like it needed something so I ran downstairs and grabbed my leftover spool of twine that I had purchased for my gaudy lamp makeover! 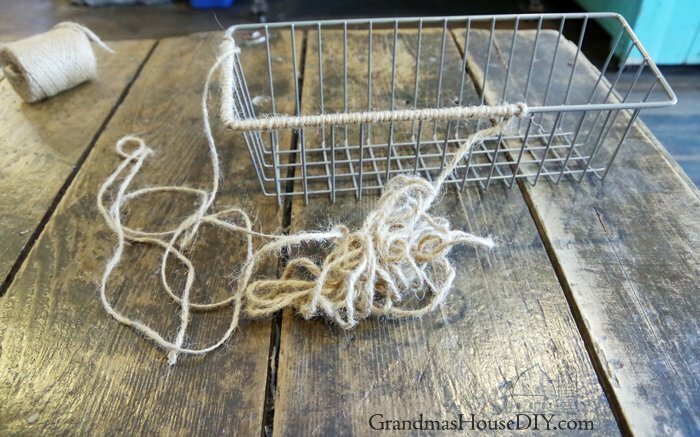 After some thought I simply wrapped the twine all around the top bar of the entire basket. Deciding not to attach it to the wall was a decision I made for several reasons and the biggest one being that I just didn’t want to drill through my back splash. 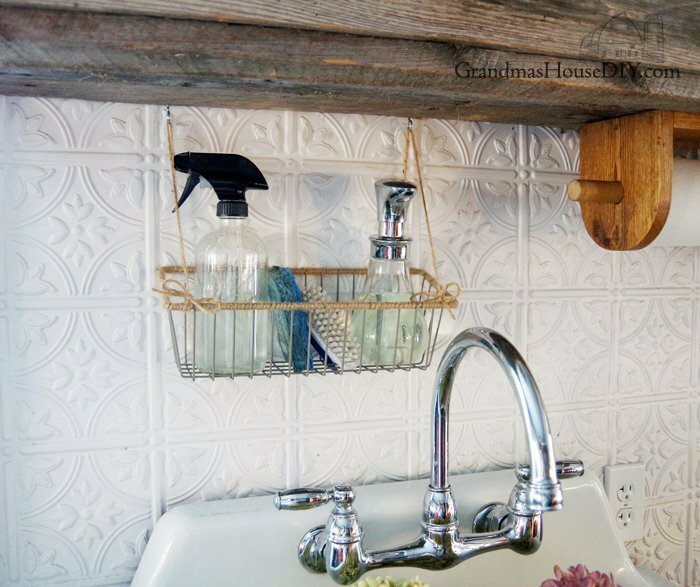 So, using the same twine and a couple of little hooks I instead simply hung the basket from the barn wood shelf I have above my sink. 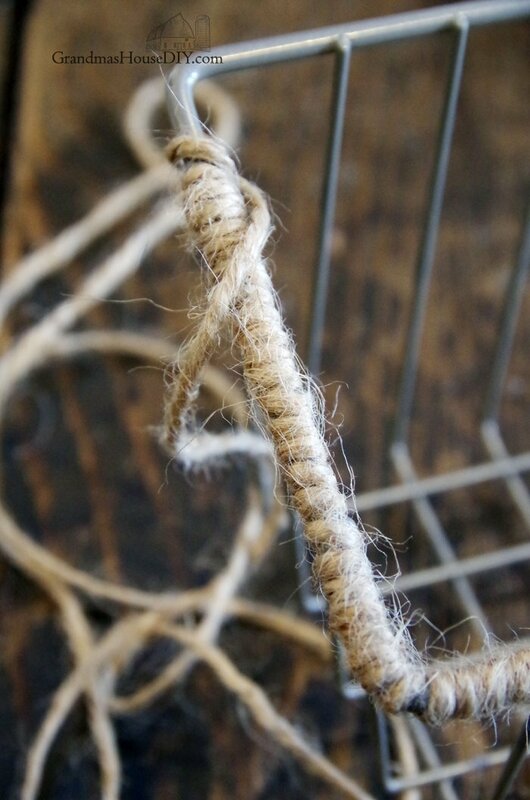 By attaching the twine to both the front and back it really is quite sturdy. 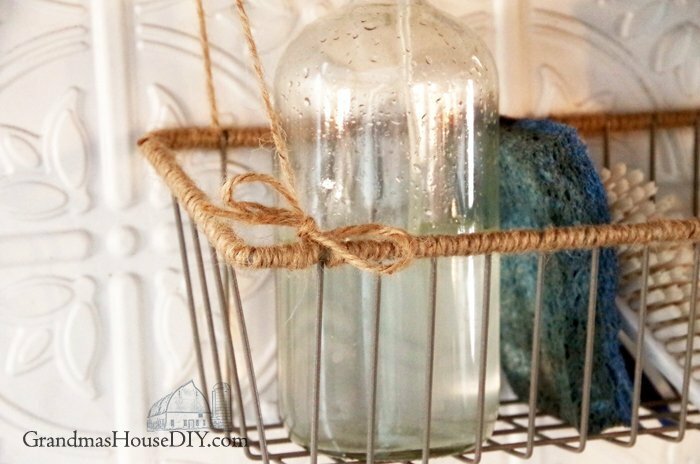 I finished the twine off with a couple of little bows and now I have such a convenient place for my hand soap, my kitchen spray that I use every day (check out the recipe here), my kitchen sponge and my potato scrubber! Your basket fits in like it was always there. Great solution. 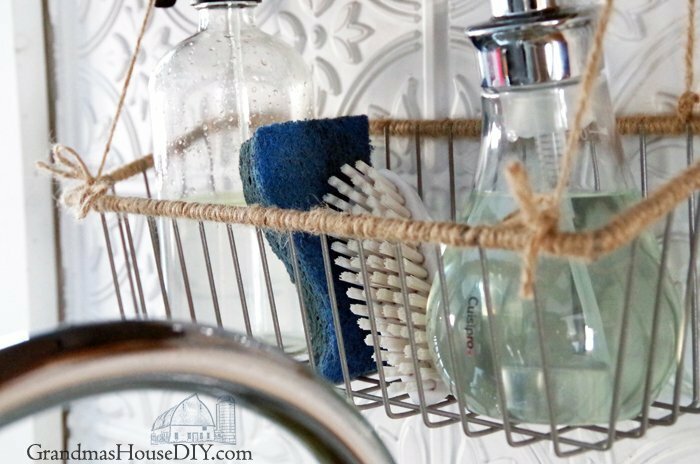 Great idea and I like the twine! Tarah, that turned out so cute and useful. It is these simple things that make life so much easier. Looks as if it had been planned all along! Cute and efficient! This is a great idea,and i love it, thanks for sharing. Love it! Almost makes me wish I didn’t have a window directly above my kitchen sink! 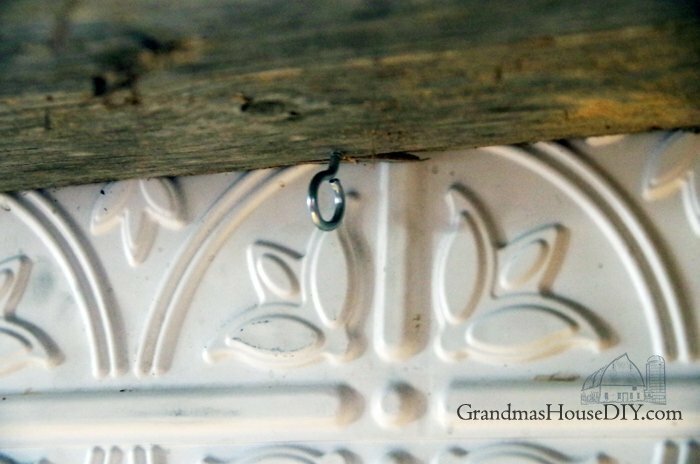 Glad to have “met” you at the Simple Homestead blog hop. Thanks Michelle! It was tough decision to decide not to have a window there, but the storage has definitely made it worth it for us! Thanks for coming by! Where did you find that cute basket. I need about 10 of them. Very cut idea going to put in my bathroom I have this big ugly mirror with vanity lights (I live in an apt) so I can’t do much about it but if I can put 2 on each end of my mirror stacked it will give me enough storage. Hey Judy, found them Amazon! Such a simple but great idea! Not only is it functional, but I love how it looks as well. Very clever! Thanks for sharing with SYC. Thank you Jann, it made my kitchen life SO much better! Hi Tarah, just popping in to let you know that you will be featured at SYC. Oh Jann thank you SOO much! I love your solution, and how you put your own touch on it. I also love your old sink and the feel of that area. 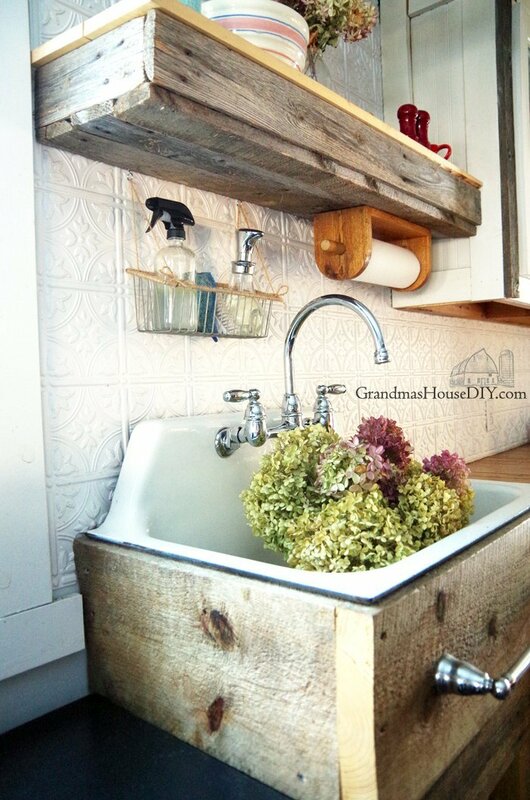 We plan to do some remodeling soon and I have an old sink I can’t wait to use. What is it about those big, old sinks?! Michelle, I didn’t know about this sink when we started remodeling but I had two major criteria: One, it had to be DEEP and Two: it had to be just one big basin (not two with the divider in the middle) I wanted to be able to get any pan in there to either wash or fill without problems, interesting on how many of the old sinks were just perfect! 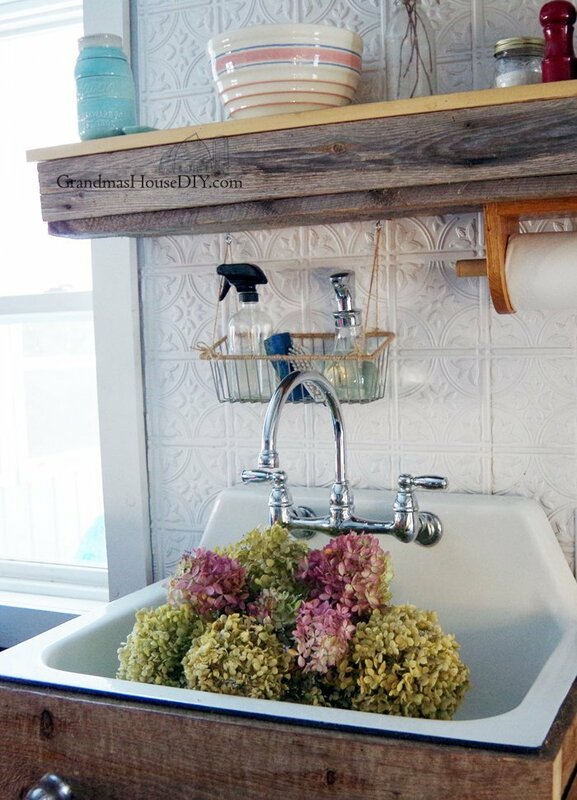 I love that sink and the hanging basket is the perfect solution! Looks great! I would love if you would join my new Friday Link Up party at http://afiremanswife.com/2017/02/24/friday-at-the-fire-station-link-up-party-1/. Have a great weekend! Thanks Jen, I’ll be there! You are amazing and your sink! Thank you so much Jeannee! Simply perfect Tarah, what a brilliant idea. Our washing up liquid is always precariously balanced on our sink and it irritates me no end. I’m so stealing your idea. Thanks Michelle, isn’t it funny how much such a little thing can drive a girl crazy!? I love the way the basket looks with the twine wrapped around the top! I don’t blame you for not wanting to drill through your tile. I’m the same way about several areas around our house! Thanks Leslie! Yeah I thought drilling holes just seemed like too much damage done, then what if I didn’t get the holes perfectly even etc? Thanks for coming by Jes!! Great idea and perfect fit. 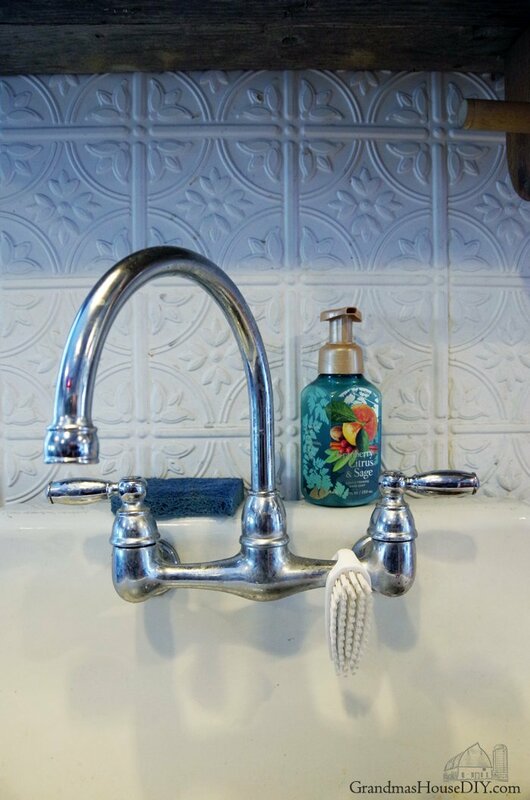 My hand soap and scrubber are in back of the faucets and it’s driving me crazy. I also didn’t want to keep them under the sink for the same reasons you didn’t. Hopefully, your solution will work well for me. Thank you for sharing with us this week at Celebrate Your Story, have a great weekend. Hey Sandra, I also liked that I didn’t mess with my backsplash and could take down this little basket any time without damaging anything. Its funny how much this improved my kitchen life lol! Thank you so much Leanna! I absolutely LOVE our sink! Lovely storage idea, I’ll have to try this one! Simple and effective – you can’t beat that. The twine along the top really does finish that little basket off. Great tutorial. Love all the pics! This is so cute! Neat idea! Very clever solution to a very common challenge in many kitchens! Thank you Carol, its improved my kitchen life SO much! 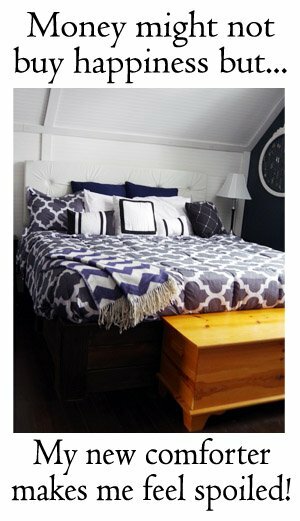 I’ve been looking for something similar and it never dawned on me to just make it myself. Great idea, thank you! 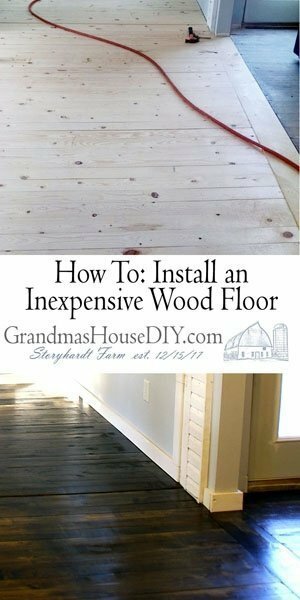 Thanks Trudy and it was so simple and easy to do! Hi there. Stopping by from DIY Party! 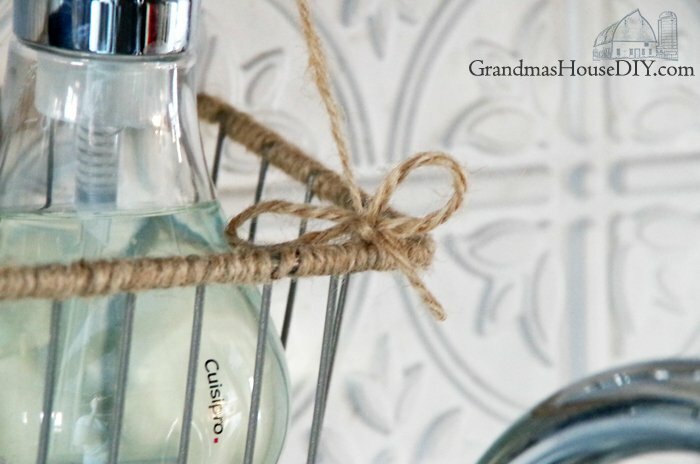 What a nifty caddy for your sink essentials! I also love that it’s mount on the wall. Every inch of counter space is important in a kitchen. Nice job. Thank you so much for stopping by Ola! 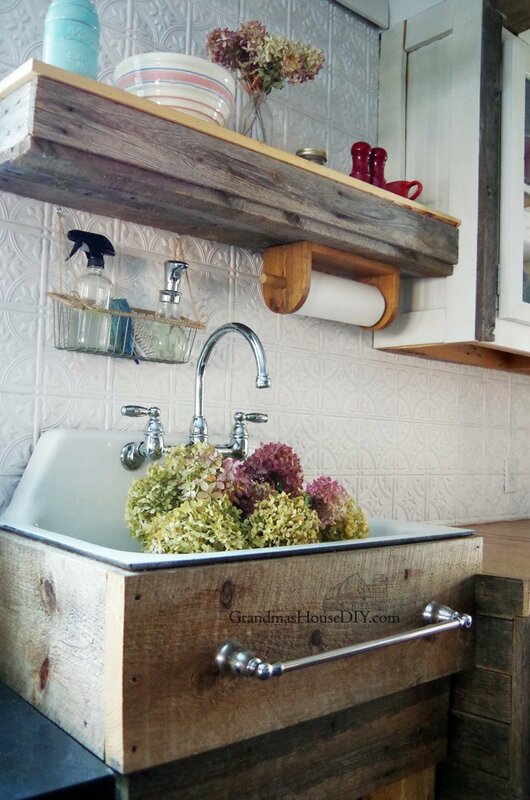 This is a clever idea and I LOVE your kitchen sink! 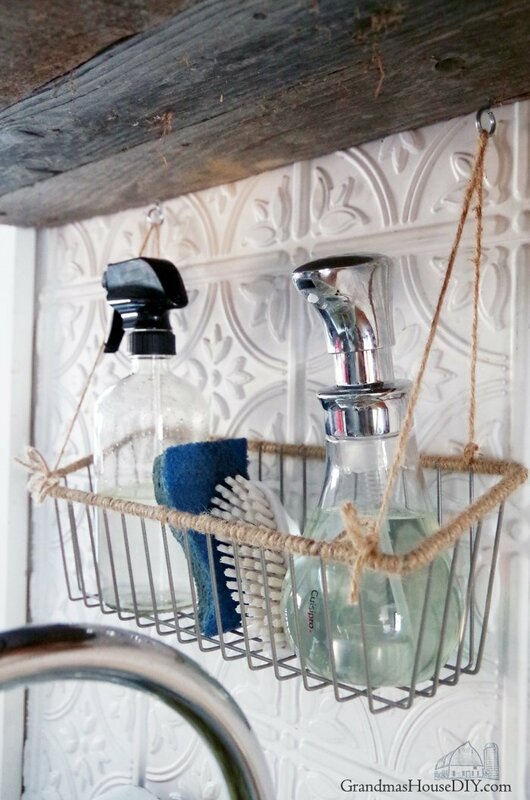 Love your clever kitchen storage solution. Thank you for sharing at the Snickerdoodle Create~Bake~Make link party! This is AWESOME. Sending this to my husband to copy. 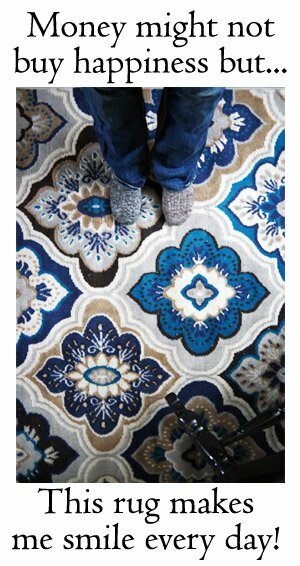 I love this idea & this site is giving me a Project List! But is there anyway to just print out the text of instructions from a post on this site without having to use several apps and/or a ton of coping & pasting? I’m old school and I need to have brief instructions but without wasting several sheets of paper on ads, comments, & pics. Please let me know. Then I’ll be hooked on this site and coming back again & again. I’ve tried several browsers already, but I can use any browser suggested except Chrome available for either Android or Windows 10. Thanks! Hey Triquetra, here is the instructions list just as text, hope that helps! I’m taking note of your request, planning on doing something similar on the site that recipe sites do, so someone can then easily just print out the plain instructions etc. Thanks for coming by! 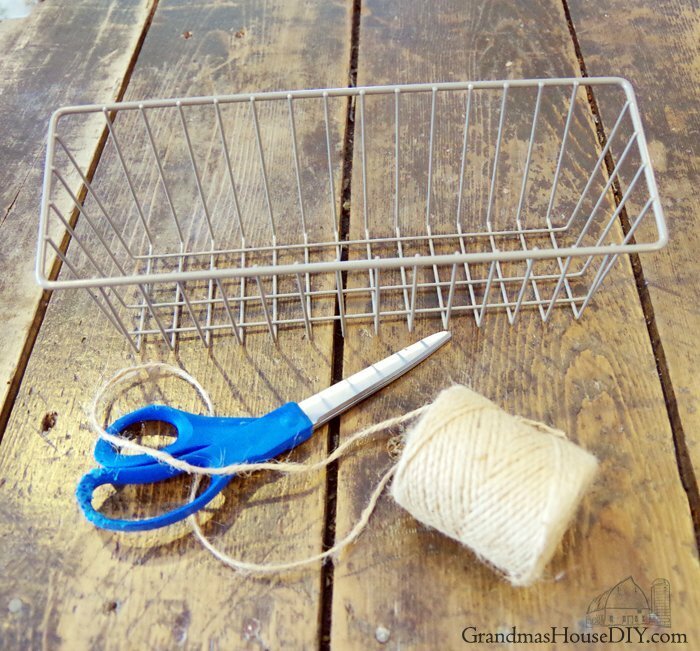 “I headed over to Amazon and did some looking for an inexpensive little basket that would accommodate everything we needed without being intrusive. I found this one and bought it immediately because I loved that the front of it was lower then the back. When it came though it felt like it needed something so I grabbed my leftover spool of twine.